BYD signing ceremony. Diamond Club. Emirates Stadium, 8/5/18. Credit : Arsenal Football Club / David Price. BYD is the official Global Car and Bus Partner to the world famous Arsenal Football Club. 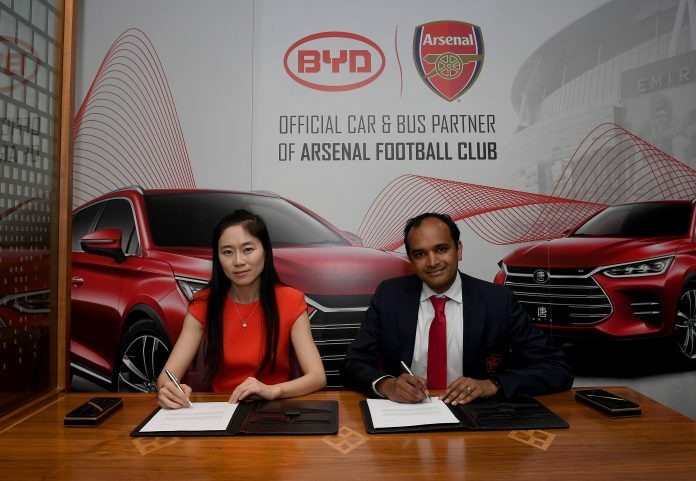 BYD and Arsenal celebrated their new partnership at a ceremony in London last week. The new partnership will focus on BYD’s strength as a leader in electric vehicles. The agreement also covers hospitality opportunities and branding at the iconic Emirates Stadium in north London, home of the Gunners, as the Arsenal team is affectionally known.